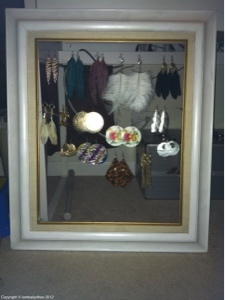 Here's a great way to display your earrings at a low cost. All items used for this display can be found for little to nothing. All you need is mesh fabric to hold the earrings, a frame to hold the mesh, and a hook or something to use to hang your frame. All these items we got from various thrift stores nearby under ten dollars. To put this display together you need to place the mesh behind the frame and pin it down using staples or a strong glue. Next step is to install the hook or wire that is going to hold the frame on the wall. Once that is done, now you can test out your display by placing earrings on the mesh. And now you have a nice way to show off those nice earrings.